The passenger air transportation market is a thriving industry, taking individuals to locations around the globe. 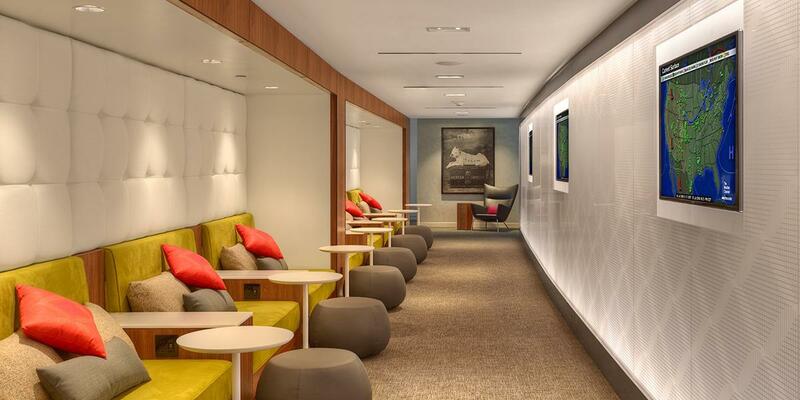 In this study, we focused on the market share of airlines that are a little closer to home. In this article, we’ll break down the top U.S. air carriers. 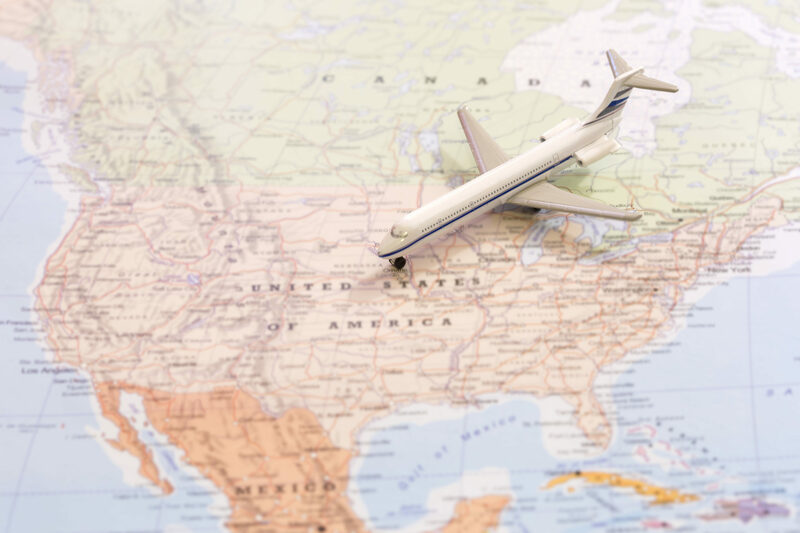 We’ve decided to take a comprehensive look at market share in a number of different ways — including per state information, as well as other important airline statistics, such as Revenue Passenger Miles. What Are Revenue Passenger Miles? All of our source information can be found on the Bureau of Transportation Statistics’ (BTS) website. More specifically, for our first 4 graphics, we used table T-100 from the BTS that contains domestic, nonstop segment data reported by U.S. air carriers, including carrier, origin, destination, and other information for transported passengers. This information represents the market share by origin state from January 2018 – October 2018, which is the most recent information available via the BTS. For our final graphic, we used a BTS source, but a different data set. We referenced the Revenue Passenger Miles from the Bureau of Transportation Statistics from January 2018 – October 2018, which, again, is the most recent information available via the BTS. Perhaps the easiest way to see which air carriers are dominating the U.S. market is by taking a look at the total number of passengers flown. From January 2018 through October 2018, Southwest Airlines was the leading airline in the U.S. in terms of passenger count with a domestic market share of 20% of all passengers flown. Delta Air Lines came in second with 16% of the market share, and American Airlines came in third with 15%. Another leader was United Airlines at 11%, while the rest of the top 10 airlines represented 5% or less of the total market share. 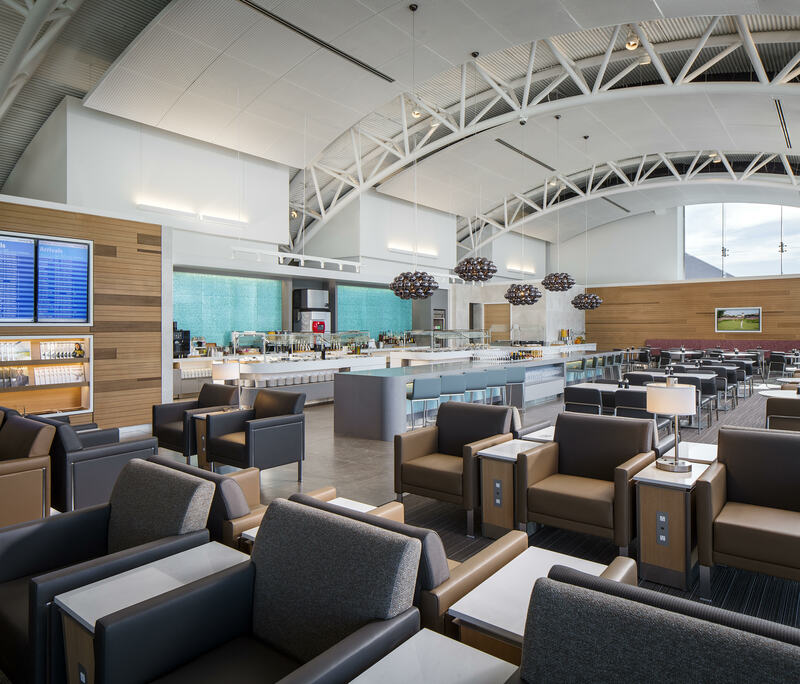 The legacy carriers (Delta Air Lines, American Airlines, United Airlines, and Alaska Airlines) had more passengers overall, even though a low-cost carrier took the number 1 spot. 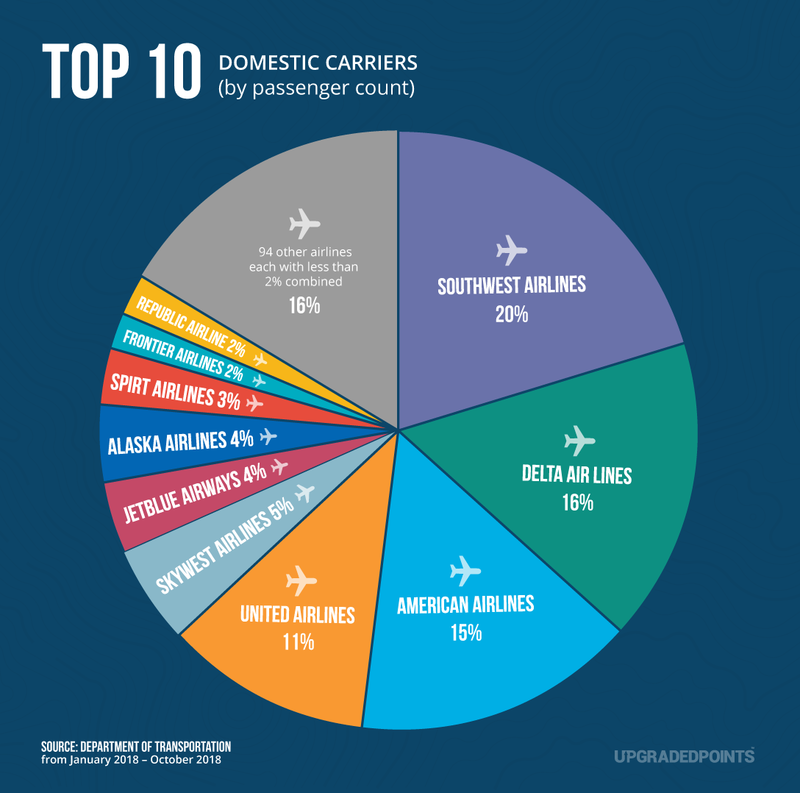 Other low-cost carriers are making a strong showing with other spots in the top 10. Next, we’ve further broken down the BTS data into market share of each carrier by origin state. Geography is one of the main factors people consider when choosing their air carrier; understandably, people are often limited by the major air carrier at each hub. This is especially true when you live in a smaller market, as there may be fewer options available to you. Some of the correlations align with company locations; Delta, based out of Atlanta, dominates the Georgia market. However, others were more surprising — like Envoy Air leading both the Arkansas and Iowa markets. Interestingly, American Airlines and Southwest Airlines are both headquartered in Texas, but American has a slight edge when it comes to the number of passengers flown from the state. In terms of geographical favorites, the East Coast is primarily dominated by Delta Air Lines, while the Southwest portion of the U.S. seems loyal to Southwest Airlines with a few exceptions. Californians are the most well-traveled bunch in the U.S., followed by Texas and Florida. On the flip side, the states that travel the least are Delaware, West Virginia, and Wyoming. We recognize that this data may be skewed given Delaware doesn’t have a major airport, and these numbers reflect a correlation with the population of the state. There are also certain times of the year that seem to benefit each carrier. 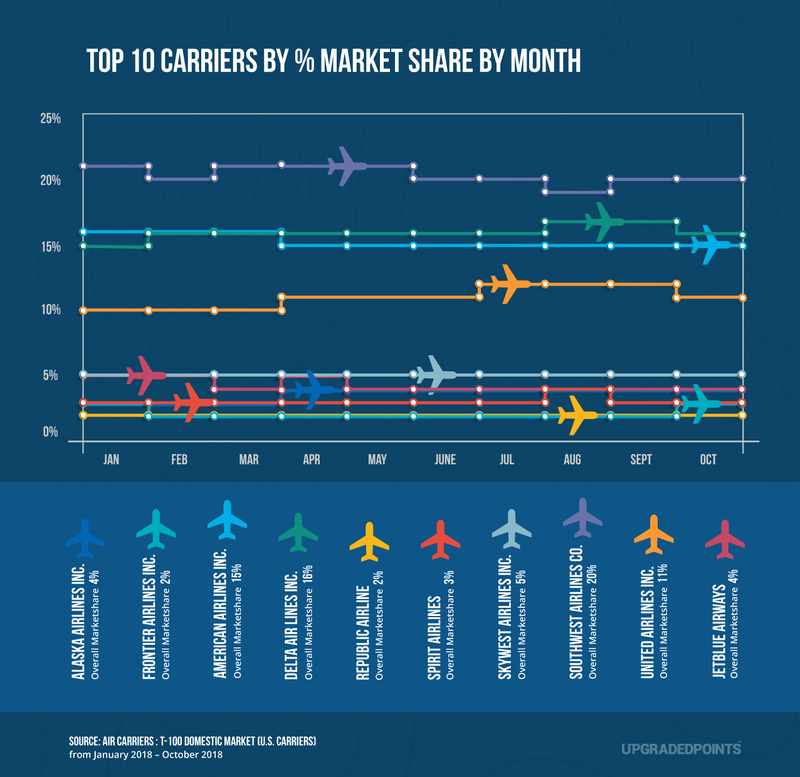 To highlight this, we’ve broken down the percentage market share by each carrier and by month. Southwest tops the chart for total passengers during each month, but American and Delta battled for second place during the beginning of the year. Throughout the year, United Airlines remained a clear fourth. The remaining top 10 airlines — including Alaska Airlines, Frontier Airlines, JetBlue Airways, Republic Airline, SkyWest Airlines, and Spirit Airlines — maintained a 5% or less market share during the entire year. In the graphic above, you can see that American Airlines squeaked into the lead ahead of Southwest Airlines with Delta, United, and Alaska (including Virgin America due to their merger) coming in third through fifth, respectively. An increase in RPM is positive for an airline since it indicates that more passengers are flying with them. Without getting too technical, RPM is often compared to available seat miles (ASM), which is a measure of total capacity. All in all, this metric helps tell an airline, and us, how many people are flying, and ASM telling how many people could they fly. By dividing RPM by ASM, an airline can calculate load factors. Higher load factors are desired since an empty seat means a lost opportunity for revenue. 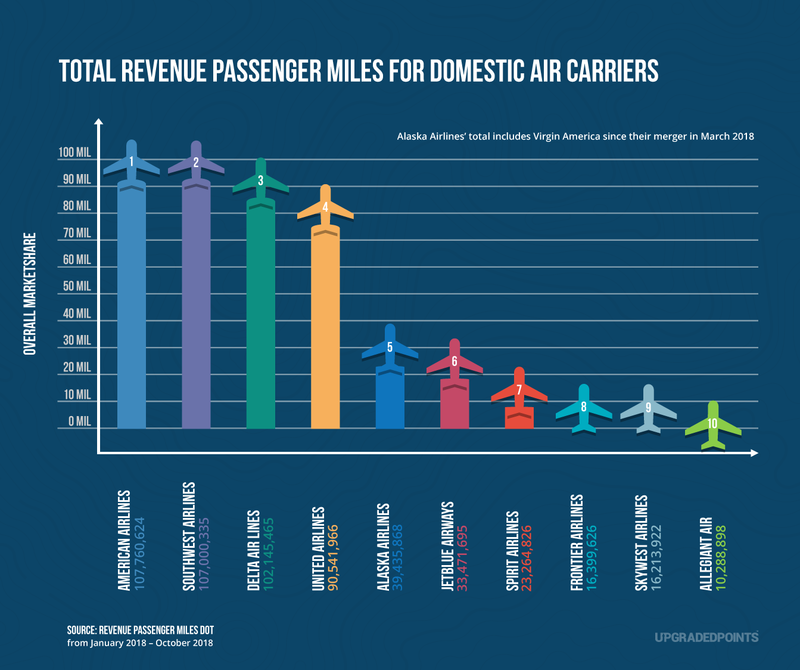 There are a number of large air carriers in the U.S., but passengers are not evenly distributed amongst them. Geography is a key factor when it comes to the airlines we choose to fly. 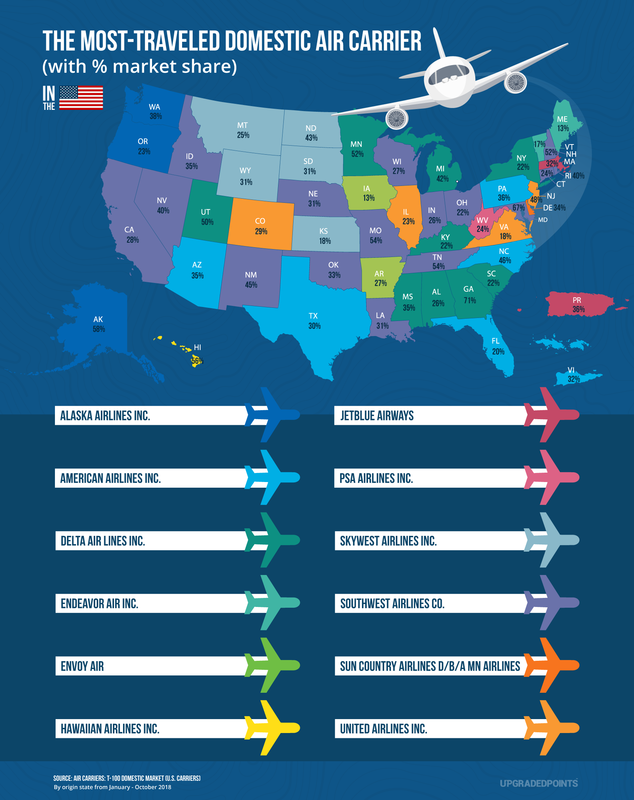 It’s especially interesting to see which air carriers dominated the U.S. market in the first 3 quarters of 2018, and which carriers have been able to secure the number 1 position by state. Informative and helpful post, thanks for the great information! Thank you so much, we appreciate your kind words! Cool data and great work on the graphics. For the “Most Well-Traveled States” section, why didn’t you just divide by the population of each state in order to account for the massive population differences between states? I feel like that would give a much more meaningful number.